As Rebecca and her fiancee are planning their garden wedding for June, they decided to stick with the garden theme when selecting the venue for their engagement photos. 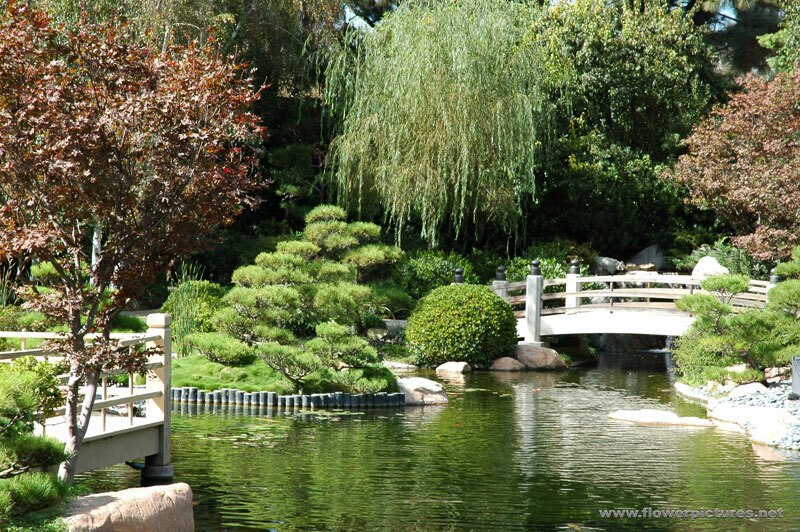 The Japanese Garden at Cal State University Long Beach (Rebecca’s alma mater) was the perfect location. It is close to home, has gorgeous views, and has sentimental value. This exciting experience is one that should not be taken lightly. It is a really great chance for a couple to bond over the awkwardness of being photographed and a great opportunity to get to know your wedding photographer at the same time. The day of your engagement photos is the perfect time to have your hair and make-up trials for your wedding day. This way you will have beautiful hair and make-up for your engagement photos as well. Rebecca chose an adorable local hair salon close to home and her wedding venue. Miguel at Di Marco Hair Salon did a fantastic job preparing her for her photos. Our cousin, Taryn (seen also in our post Back to the 80’s) was at the house ready to complete Rebecca’s glamorous look. She will also be there on the big day (not just as a guest), but with brushes and false lashes in hand prepared to make the Bride up. It is also fun to get a new dress for the occassion. Try something bright in color to make yourself stand out against your surroundings. Rebecca got this jewel toned cocktail dress from Macy’s. 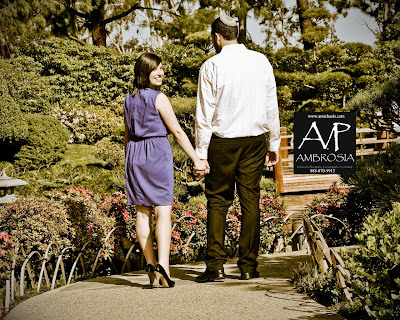 The couple looked great walking around the Japanese Garden thanks to Miguel and Taryn. They look forward to framing some of the photos they took and hanging them in their home. 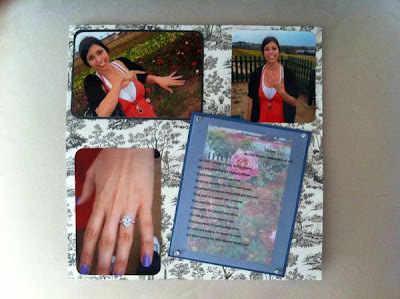 Engagement photos are also great to use as part of your wedding decor, save the date cards (as seen on our post Save the Date), and guest book pages. Creativity is key. Lauren and Scott used their engagement photos as a slideshow on their hotel lobby announcement boards the night of their wedding. 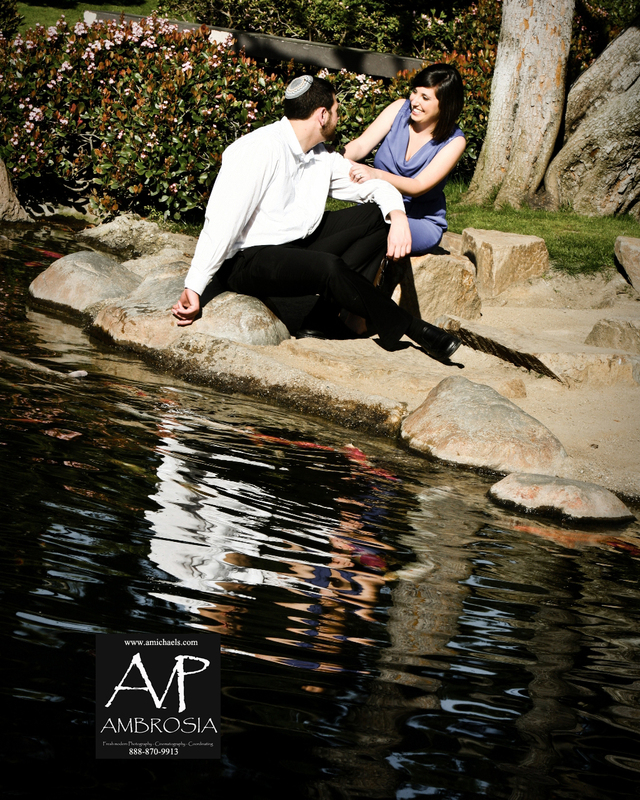 Whatever you choose to do with your engagement photos, enjoy the experience and remember to smile. Engagement photographs taken by Allen at Ambrosia Event Services. We can’t say we are surprised, but we are obsessed with Pinterest right now. We find ourselves checking it in the morning before we get up for work and every night before we go to bed. We love to see what has been inspiring our friends and the people we are following. It’s an excellent way to find creative ideas for our next project or save a picture that is sure to come in handy at a later time. Since we know so many of you share our love for Pinterest, we decided to put together our own conceptual boards to show you what inspires us this Spring. We hope our individual styles will inspire you as well. Tami’s Pins: I was inspired by all different shades of pink this Spring. I generally gravitate towards vintage looks with feminine but edgy details. I love all the floral patterns that are out right now, and couldn’t help but think how fun it would be to design a space or plan an event based on my inspiration photos. 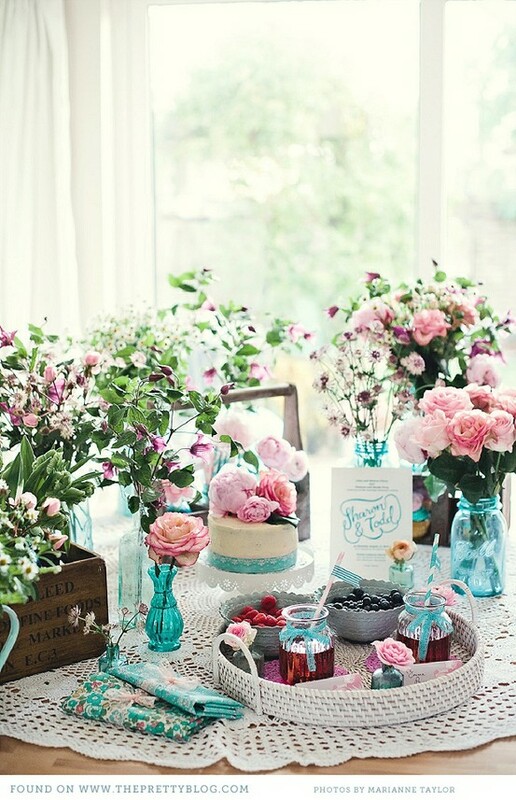 I picture this look being used for an outdoor vintage Bridal Shower, however it could be used for a variety of events. I could stand to cook in this kitchen. 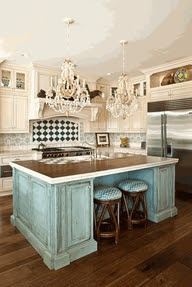 I love the contrast of the distressed, rustic island with the formal chandeliers. Loving the garden flowers and splashes of turquoise. The Mason jars and wood crates are amazing as well. 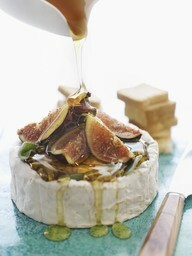 Figs, Honey + Brie = Delicious, and the turquoise counter ties in perfectly with my color scheme. No event is complete without the perfect invitation to set the mood. 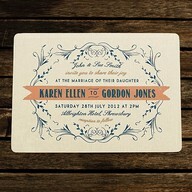 This vintage invitation would do just that. Ruffles on a cake with peach frosting is beautiful on a light turquoise cake stand, and these flower cookies with the gold center go well with my garden theme. 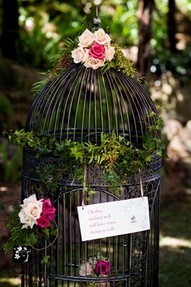 Bird cages look stunning when decorated with flowers and could be used to hold cards or wishes for the Bride-to-Be. The black adds something edgy and unexpected. Blushing Bride cocktails with sugar on the rims would be a fun addition to this party. DIY party favors made from burlap and vintage patterned paper completes this event. Lauren’s Pins: I love the idea of throwing in pops of fun colors to give my signature monochromatic and modern look a Spring feel. My favorite color right now is coral, and I love the idea of pairing it with kelly green. Adding in touches of geometric patterns in classic black and white and gold details completes my vision. This inspiration board would be amazing as the overall concept for a milestone birthday this Spring, and can be used for many other types of events as well. Obsessed with the different two tone patterns used in this living room (especially the rug). The coral, green, and gold accessories tie the whole look together. An intimate luncheon is complete with formal chairs and glassware, tons of Spring florals, and tissue paper poms. 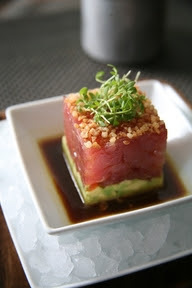 You could easily serve this exquisite tuna tartare with avocado and soy-lime dressing to keep things classy, and it just looks so amazing. 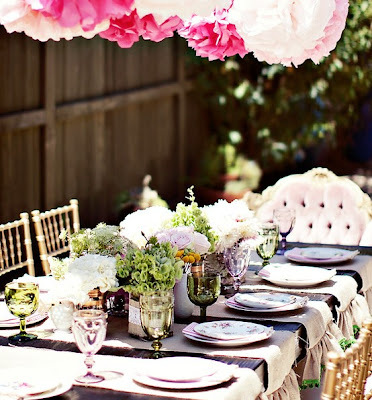 Such a creative invitation for a Spring luncheon. 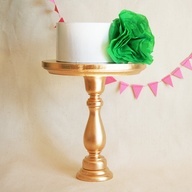 I want this gold cake stand. A small cake would be perfect for this type of party. 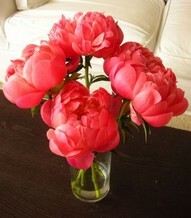 Coral peonies show off my color scheme. These fun coral and gold cake pops would be a perfect additional dessert option. 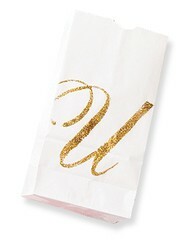 Simple gift bags are made fancy with gold glitter letters. Before Courtney read Ben her vows at The Farm at South Mountain on this season of The Bachelor, this location was used for the wedding of our very dear friends Luke and Angie. So in honor of their 3rd anniversary (which is today), we would like to share some details from their Whimsy Wedding with all of you. Luke and Angie had only been engaged for a couple of hours, and Angie was already enlisting Lauren to help her in the planning process for their wedding. 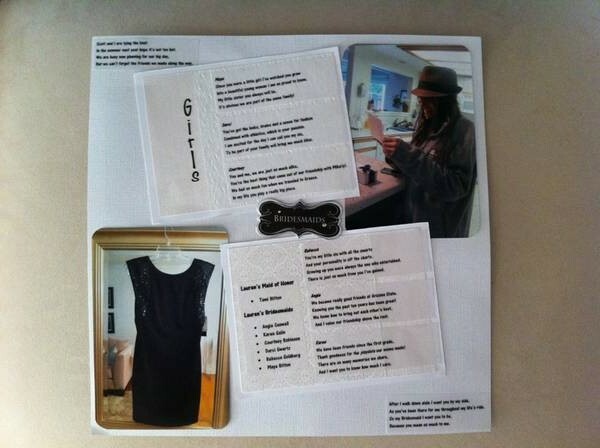 The two worked “side by side” to bring Angie’s vision to life, sending inspiration pictures back and forth almost every day. Everything from the purple and red color scheme, to the desserts, to the floral arrangements was well thought out and personalized. Angie enlisted Tami as well to help out with some key DIY projects. She made this sign that helped guests find their way, as there was only a small road leading to the wedding location from the main street. It followed the lovebird theme from their wedding invitations and incorporated adorable paper flowers seen also throughout the reception area. Lauren had the privilege of shopping with Angie for this gorgeous lace and tulle Cymbeline dress. A variety of red patent leather shoes gave a whimsical touch to the traditional purple satin bridesmaid dresses. Can you tell which shoes Lauren couldn’t wait to buy when Angie asked her to be a bridesmaid? The Bride couldn’t pass up these shoes (in the middle). They were the perfect combination of traditional bridal shoe with a twist. The finishing touch were the bright bouquets in shades of red and purple that each girl held as she walked down the aisle. Personal touches make a ceremony space special. The couple hired a string quartet from the Bride’s alma mater, Arizona State University. Fresh apples and garden flowers were used in the decor, strings of flowers decorated the gazebo, and flower petals going from deep red to light purple filled the aisle. As Angie walked down the aisle, Luke could not have looked happier. They said their “I do’s” surrounded by all of their family and friends, many of which came to celebrate from their home state of Iowa. The Farm at South Mountain has many unique spots that lend themselves as perfect backdrops for this type of creative photo including a quilted tree, a bright turquoise door, and this rustic tractor. Tami also made additional paper flowers to decorate the dessert table. She used different patterns and textures to give each one a unique look. Personalized Hershey’s Kisses with the couple’s names and wedding date along with their signature lovebirds were a nice addition to the wedding decor. As Angie and Luke fell in love with Sprinkles cupcakes while in living in Los Angeles, they were excited to find out that a shop had recently opened up in the Scottsdale area. So excited that they decided to forgo the traditional wedding cake and have cupcakes instead. Lucky for them Sprinkles signature heart matched their color scheme. Our fondest memories from attending this wedding are of the dance floor. Everyone got really into bringing back old school dance moves and it stayed packed all night. We can’t believe it’s already been three years. For us the time has flown by, but Luke and Angie have an adorable little girl, Harlow, to show for it (as seen on our post: Mod Nursery). Happy Anniversary Luke and Angie. We wish you all the best in many more years to come! All photographs taken by Kimberly Jarman Photopgraphy. 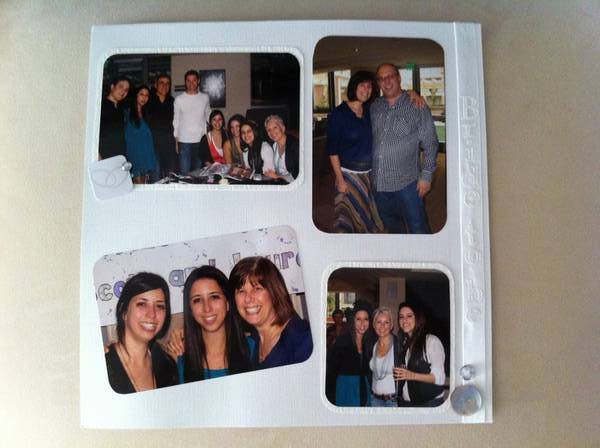 For anybody who has tried their hand at scrapbooking, they know that it is not only an art as it takes a lot of time and creativity, but it is a way of making your memories last forever. 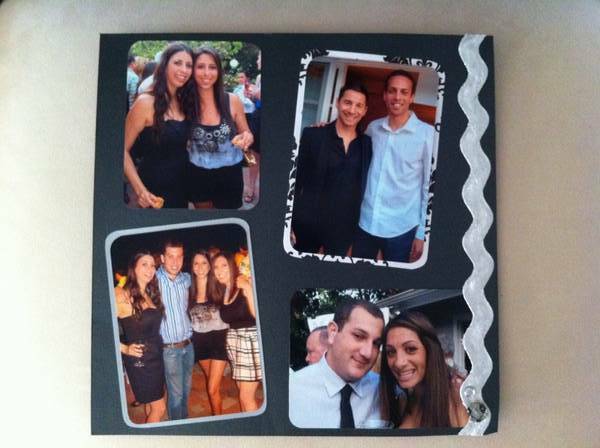 Making a scrapbook for a friend or loved one is a very special gift. When a couple is planning their wedding, many events take place that they will want to document: the moment of their engagement, an engagement party, asking their closest family and friends to be part of their special day, save the dates, bridal showers, bachelor and bachelorette parties, dress trials and fittings, food and dessert tastings, etc. 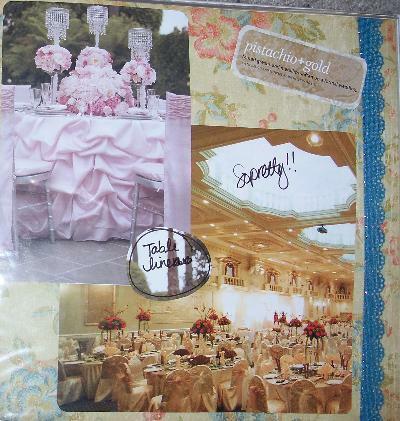 However, with attending and planning all of these events along with the amount of time it takes to plan a wedding, a couple rarely has time to organize photographs let alone create a scrapbook to document their events. 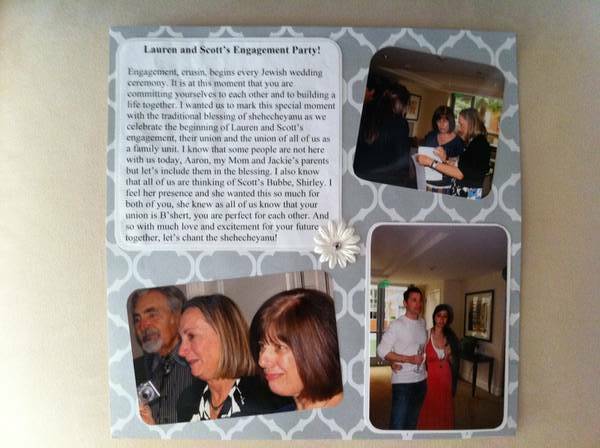 When Tami told Lauren she wanted to create a scrapbook of these events as her wedding gift to her and Scott, Lauren was so excited and beyond grateful. 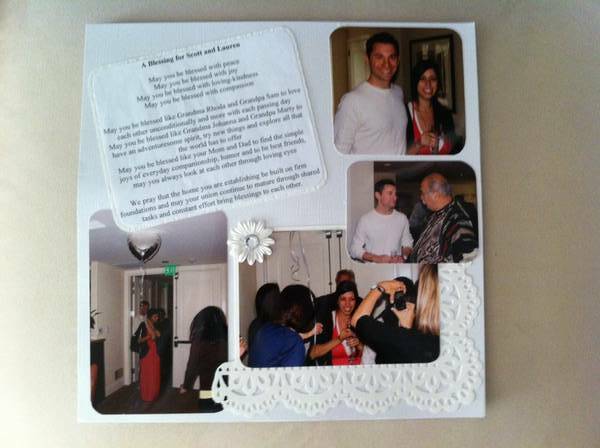 First, Tami selected a scrapbook that complimented the Bride and Groom’s style. Lauren found this scrapbook at Joann Fabrics before Scott had even proposed. She expressed her love for the white satin and velvet details to Tami. When Scott told Tami he would be popping the question, he encouraged her to go back and get the scrapbook Lauren loved. 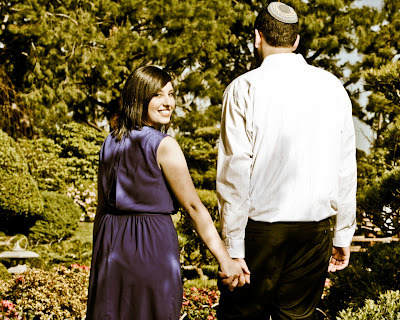 A black and white engagement photo was added to the cover to give a personalized touch. On April 11, 2010 Scott surprised Lauren with a special poem and a diamond ring (as seen on our previous posts Guest Blogger: “A Rose” and More Than Just a Ring). Tami included many important memories into the beginning of Scott and Lauren’s scrapbook: a letter from the Hotel Manager where they stayed during the weekend of their engagement, the date that Scott popped the question, the name of the location and pictures of where it happened, and the poem Scott wrote for Lauren. The black and white toile print paper paired nicely with touches of royal blue. 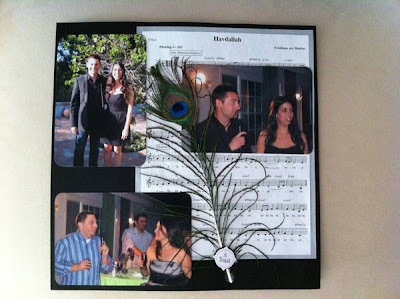 She also included a peacock feather on the first page as this was Lauren’s inspiration for many decor aspects of the wedding. As if getting engaged wasn’t enough of a surprise for one day, Scott got all of his and Lauren’s immediate family together to celebrate. A blessing written by the Mother of the Bride and a letter from a brother who couldn’t be there that day were included as memories from the day of Scott and Lauren’s engagement. 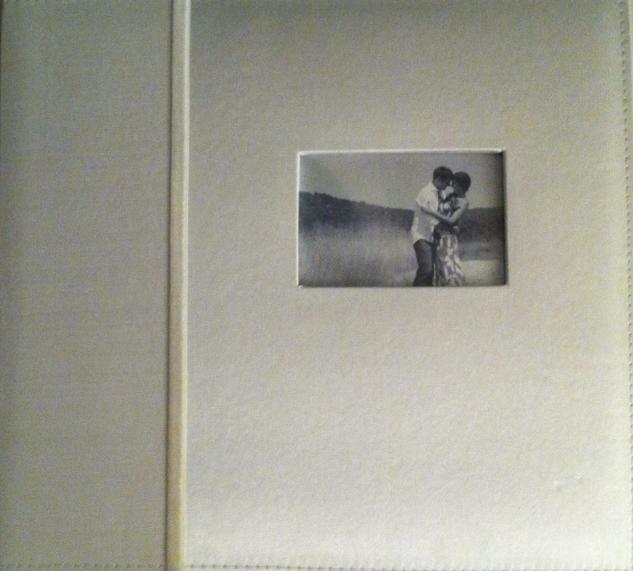 The true beauty on these pages is in the photographs themselves. The pure joy in everyone’s faces mixed with emotion shows how happy everyone was that day. Tami used a white color scheme for these pages with touches of gray. White lace-like paper, fabric flowers, ribbon, and rhinestones created interest. Scott and Lauren took great pride in asking their closest friends and family to be in their wedding party. 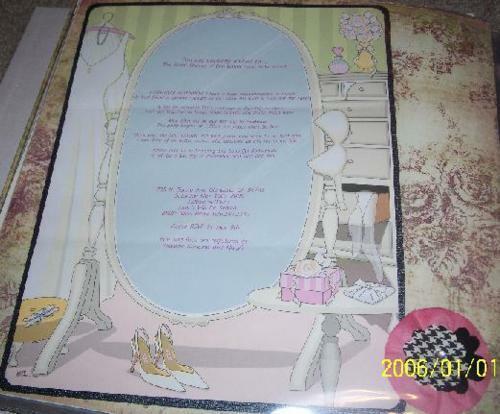 They created special poems that they gave to each Bridesmaid and Groomsman along with a small gift to show their appreciation (seen in What to Gift Your Wedding Party). These poems were added to their scrapbook to capture this memory. A simple black and white color scheme was used in this section of the book. 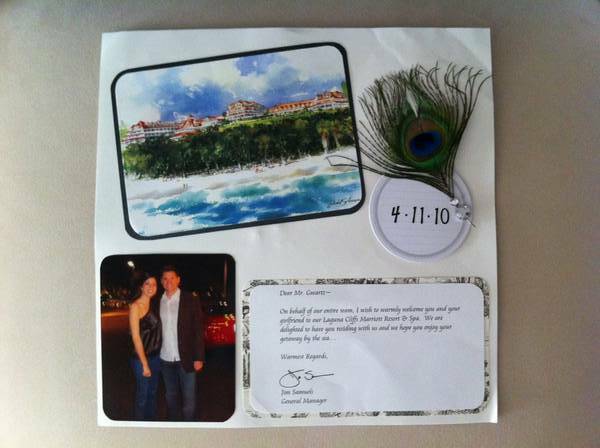 Tami used the same prints and textures found on the cards Lauren and Scott made to tie everything together. 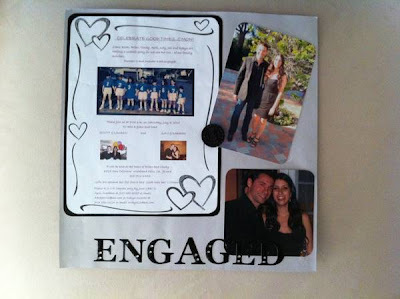 As Lauren and Scott got engaged just one day after Scott’s cousin, Zavi, their family decided to throw them a combined engagement party. The purple and green theme came from Lauren’s favorite color and Zavi’s fiancee’s last name as a welcome to the family gesture. 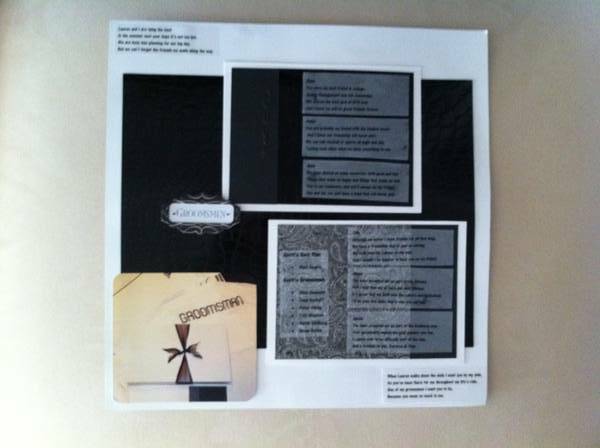 Tami decided to use an all black and silver color scheme for these pages to compliment the purple and green in the photos. 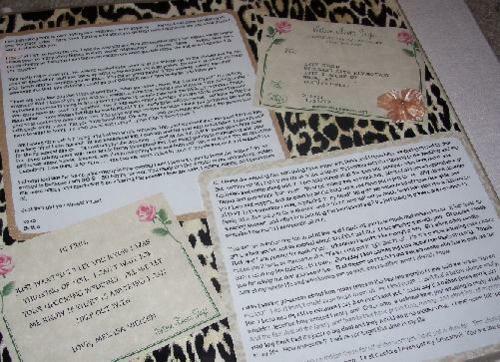 The invitation and guitar melody for Havdallah (which was celebrated during the party) were included, as well as decorative details such as: buttons, rhinestones, wavy ribbon, and another peacock feather to complete each page. Another idea for a wedding gift could be a scrapbook of inspiration pictures used throughout the planning process. Rick and Erin enjoyed being able to go back and see their ideas they had before the wedding. 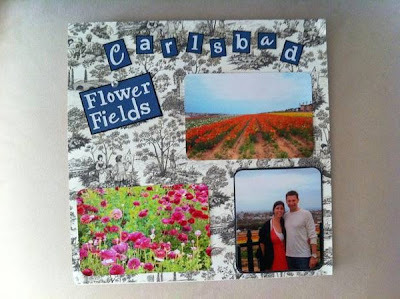 Whether the scrapbook you create tells the story of the Bride and Groom’s journey through all of their pre-wedding events or the details of planning their special day, a wedding scrapbook is a very thoughtful and meaningful gift. 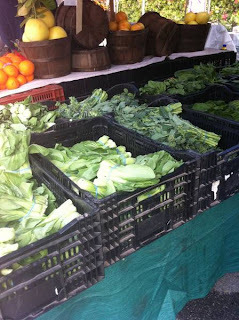 With St. Patrick’s Day just around the corner, we were on the lookout for a special green recipe to help us celebrate. Although there are many adorable St. Patty’s Day treats we could have made (green pancakes, pot of gold cupcakes, leprechaun hat cake pops, etc. ), we decided to go on a more healthy route and do something that was a little unexpected. 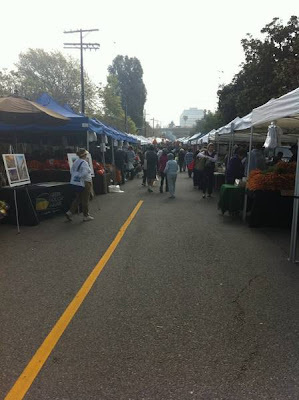 While on one of our usual Sunday rituals, a walk through the Brentwood Farmer’s Market, we were inspired by all the fresh, green options. Why not support the local farmers and use St. Patrick’s Day to “go green”? With our arms full of fresh, organic veggies, and only having spent $10 for all our findings, we headed home to start cooking our meal. We decided to make an entire green meal consisting of limo-nana, kale chips, and spinach stuffed chicken. 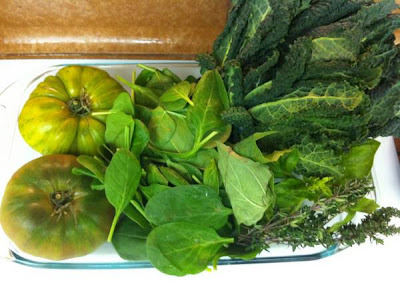 To complete our meal we used all fresh, organic (and green) ingredients from the Farmer’s Market: heirloom tomatoes, spinach, thyme, basil, mint, and kale. In Hebrew, mint is called “nana”. 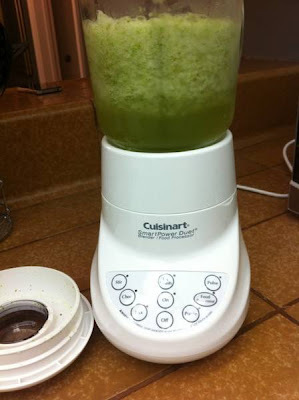 This mint and lemonade mixture is a very popular and refreshing drink found all over Israel. This healthy, crunchy snack is a great substitute for greasy potato chips, and with a little salt you barely even notice the difference. 2. Wash and thoroughly dry a bunch of kale. 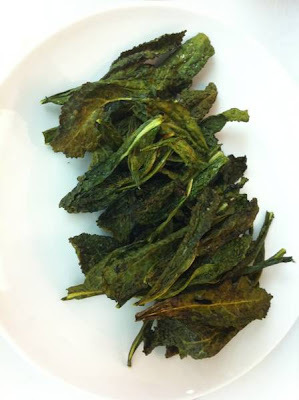 Carefully remove kale leaves from the thick stems and tear into bite-size pieces. 3. Lay leaves out on a cookie sheet, drizzle with olive oil, and sprinkle with salt and pepper. 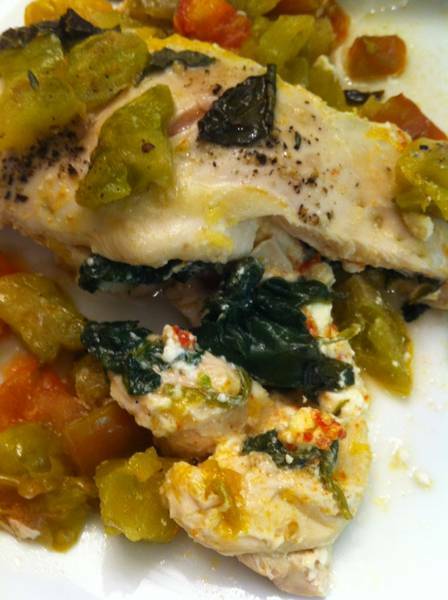 Stuff chicken with spinach, sun-dried tomatoes, and feta. 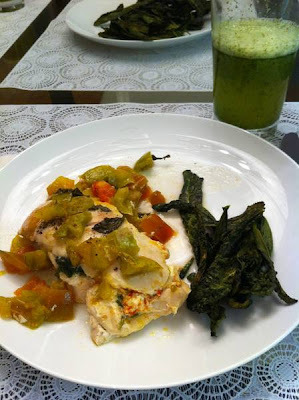 Cover with a fresh heirloom tomato sauce. It’s as tasty as it looks. 2. Rinse boneless chicken breasts and slice lengthwise to create a center pocket. Do not cut all the way across. 3. In a pan, sautee spinach and garlic in olive oil. When all the leaves have condensed, add the sun-dried tomato and feta mixture. This will create a stuffing for your chicken. 4. Stuff each chicken breast with the filling mixture and close the open end with a toothpick. 5. Line chicken breasts in a baking pan and season with salt and pepper. 6. 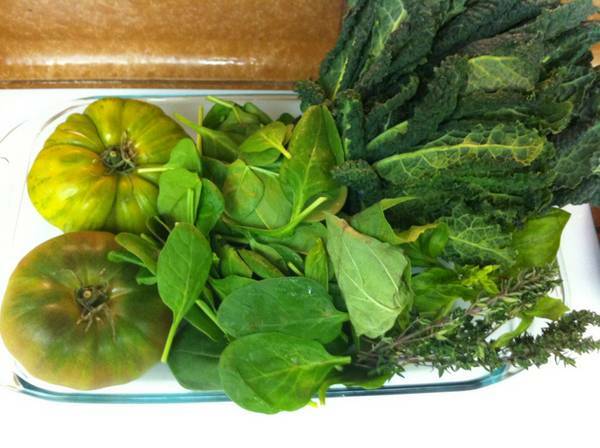 Chop heirloom tomatoes, fresh basil, and thyme. Fill open spaces in baking pan with tomato mixture. 7. Bake for 45 min. or until completely cooked through. Tomorrow is officially St. Patrick’s Day. We want to challenge our readers to use this day as an excuse to “go green”.